What are the main features of the DN-205W speakers? What type of speakers does the DN-205W use? What are the dimensions of the DN-205W? Does the DN-205W come in different colors? What is the frequency response for the DN-205W? Is there a way to adjust the frequency response? Does this speaker require a break-in period before they can be operated at maximum volume? Why should I break-in my speakers before operating it at maximum volume? The DN-205W has two 5.25” / 133.4 mm carbon fiber comes with a 1" / 25.4 mm aluminum swivel tweeter. Please see below for the DN-205W dimensions. 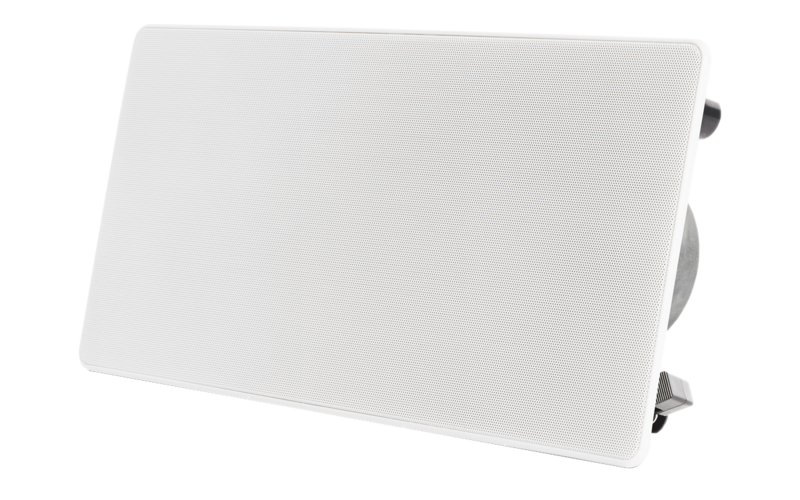 No, the DN-205W does not come in different colors but the grill and frame can be painted to match your walls or ceiling, making the speaker less noticeable. The frequency response for the DN-205W is 62 - 20kHz. The DN-205W is equipped with a high-frequency roll-off option, which can be used to attenuate the high-frequency response. If the speaker sounds too "bright", perform the following steps to set the high-frequency roll-off. Pull the edge of the grille to remove it. Adjust the high-frequency roll-off switch to the -3 dB or -6 dB position. The default setting is 0 dB (no attenuation). Replace the grille onto the speaker body. Yes. The break-in period is between 50-80 hours playing normal music at moderate volume levels. It will take somewhat longer in a cold or dry environment and a little less time in a warm or humid environment. Notes: The break-in period does not have to be continuous. Put some insulation (R-14) in the wall/ceiling space before you install the speaker to improve the sound. It is important to break-in your speakers as they will produce richer sounding lows, warmer and smoother sounding mids, and cleaner highs.